Hello! Whenever I take a vacation, I love to preserve my memories of our trip. I primarily do this by blogging about it. It is a beautiful way of chronicling our adventures for my family and I to read about all our fun times, and perhaps inspire others to travel also. The second way I preserve memories is by taking lots of pictures and either scrap booking them or just putting them in a photo album. But another fun way to remember the good times on my vacation is to buy something - a souvenir - that represents some aspect of my trip. Sometimes, I don't need to buy anything at all, like when I brought sand and seashells home from our Pensacola Beach vacation. I created THIS to help me remember all the hours my husband and I spent combing the beach looking for interesting seashells. But because the western part of America is so different culturally and geographically from my Mid-Western roots, there was a lot I wanted to buy and bring home, and I did! 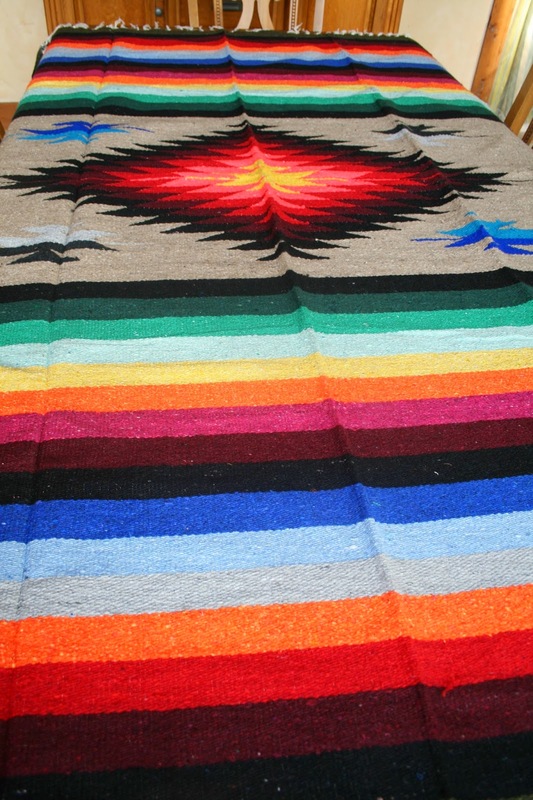 First up, this beautiful Mexican Blanket. You see these everywhere in New Mexico and Mexico and they are very, very inexpensive. You can get one for as little as $9.99 but those don't have much color. I paid $25.00 for this one because I loved the rich color. I looked long and hard for just the perfect blanket before I spotted this beauty, and it was love at first sight! These blankets are worth every penny because they are so durable! I actually already own a black and white one that my husband's grandparents gave to him over twenty years ago when friends of theirs went on a missionary trip to Mexico. He keeps it in his car for emergency reasons now, but it is still in great shape. When choosing souvenirs, I like to buy things that not only have a special memory for me, but that I will be able to put to good use as well. I don't like knick-knacks that sit on a shelf and gather dust. It has to serve a purpose, but also represent some aspect of my trip to me. So these are the total items I bought: a blanket which totally represents the Southwest with it's style, color, and durability, a western style purse, a cowboy hat, three pieces of costume jewelry, and two tee shirts. Now, I'm really not a tee shirt girl, but I do buy at least one tee shirt every time I take a trip. Why? Because I will make a memory tee shirt quilt out of them once I have collected enough. So when selecting my tee shirts, I try to find a pattern or image that not only represents my trip and experiences, but also would make an interesting piece for my quilt. The tee shirt below certainly fits the bill! 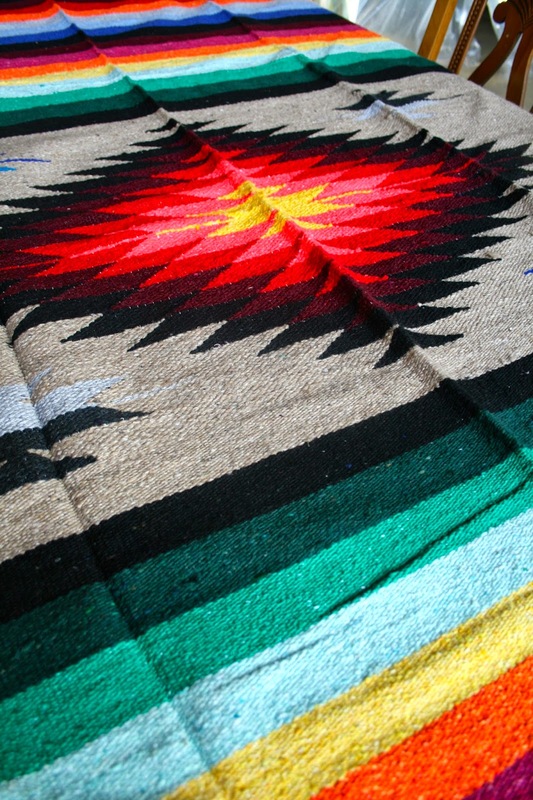 It has a raised texture that will look amazing on a quilt, and the patterns and colors are very symbolic of New Mexico culture and history. Now even though I traveled through many states on my road trip, I spent the majority of my time in two states: New Mexico and Colorado. So I wanted a tee shirt from Colorado as well. I found this one on clearance in a Colorado Springs gift shop for only $3.99! It was perfect, since we went up to the top of Pike's Peak. I never saw a bear in Colorado though, so it didn't represent that part of my journey. It was almost impossible to find a tee shirt without a bear on it. I asked the gift shop owner if they really did have a lot of bears in Colorado Springs, and he said 'Oh, yes! And they are quite the nuisance. You can never leave your garbage cans outside even if you live right in town!' I can't even imagine that. We have bears where I live too, but we rarely, if ever, see them. When someone does see a bear, it usually makes the newspaper or evening news! My fashion forward find was this beautiful, well-made country style cross body bag. I actually can't believe I bought this to tell you the truth. It was quite expensive to me for a handbag that I wouldn't use everyday. I paid over $50.00 for it, and I even bought it on sale. The bag is by Montana West and you can buy them at any country western store or on-line, you don't have to drive to Colorado Springs to get one! My husband was actually drawn to the style of these bags and persuaded me to purchase it. I finally relented because it is so different from any other bag in my closet and it so well made. I also think it will last forever, because it will never go out of style. It has a very different strap, which we weren't quite sure we liked. It's adjustable and has the brand name stamped on it. It is actually quite roomy for a cross body bag, and more practical than I thought it would be when I bought it. I managed to use it twice since I've been home. You may remember seeing it in This POST. Well, I'm sure by now you all know how much I love jewelry! What better souvenir to buy than jewelry! Every time I wear it, I'm reminded of my awesome vacation. I bought three pieces of costume jewelry on this trip. More than anything, I wanted something turquoise because New Mexico is known for this precious stone. However, I wasn't prepared for how expensive it was, and I just couldn't stomach paying those prices. But I couldn't leave the west without something representing this stone, so I bought this triple strand imitation turquoise bracelet for around $18.00. I love it because it not only has the turquoise color that New Mexico is known for, but it also has a beautiful cross to represent my faith. The other two pieces of jewelry I found in Colorado Springs. I loved the silver and blue stone bracelet, but my favorite jewelry find of all was the aspen leaf necklace. Would you believe it is a REAL Colorado Aspen leaf? Colorado is known for it's beautiful Aspen trees. We saw them everywhere in Colorado exhibiting their beautiful fall color. The leaf is covered in a thick glaze and attached to a gold chain. It is so pretty, practical, and a beautiful memory at the same time! My kind of souvenir! And my final souvenir is so totally NOT me, but it is so fun and definitely represents the west: a cowgirl hat! If you would have told me that I was going to come home from my vacation with a cowgirl hat, I would have thoughts you were nuts! Western style is not me. However, I must have gotten in the spirit of the west, and when I saw this beauty blowing in the wind, it caught my heart. After I rescued it, I tried it on, and thought 'Well, I could use some shade from the hot sun', and I bought it. It actually came in handy on our trip, and you probably saw me wearing it in a lot of my photos, like THIS ONE. Will I ever wear it again? I don't know. Probably not. Maybe, if I have the perfect coordinating outfit on. In the meantime, it looks really cute displayed on my antique coat rack in my office. I really like the darker shading in this hat, it's shape, and how it had the turquoise stones which represent New Mexico strung through the chin strap. Well that's it folks. That is what I bought on vacation out west. So what about you? Do you spend a lot of money on souvenirs when you travel? What kind of items do you buy? I'd love to hear from you! Such fun souvenirs! And what a fabulous idea to collect t-shirts to create a quilt! The hat does look awesome, although I don't wear that style either. It just looks really pretty with the turquoise stones. I don't usually spend a lot of money on souvenirs, mostly because we are probably already broke from the travel expenses LOL. But I do usually pick up some cute things to help remember the trip. Oh superb ! the bag is gorgeous ! !